Service on parts of the Orange and Silver Lines will remain suspended through Sunday, following a Friday morning derailment near the East Falls Church station in Virginia. WASHINGTON — Service on parts of the Orange and Silver lines will remain suspended through Sunday following an early-morning derailment on Friday near the East Falls Church station. The derailment damaged two train cars, sent one rider to the hospital and scrambled passengers’ morning commutes Friday. Metro spokesman Dan Stessel said Saturday that the goal was to reopen service at 5 a.m. Monday. The derailment issues will not impact the start of the Red Line’s scheduled track maintenance on Monday, according to Metro officials. The East Falls Church Metro station will remain closed through Sunday. In addition, Silver Line service between the McLean and Ballston stations will be suspended, as will Orange Line service between the West Falls Church and Ballston stations in order to allow for a “thorough investigation and allow for necessary repairs,” WMATA said in an emailed update. Metro says bus service is available to riders to fill in the gap. On Friday, the fourth and fifth cars of the outbound six-car Silver Line train derailed just east of the East Falls Church station at about 6:15 a.m. The cars remained upright and in line. Officials have not said how fast the train was going. Metro officials said 75 passengers had to be offloaded to the platform. Two passengers were evaluated for minor injuries, according to the Arlington Fire Department, and one person was transported to the hospital with a non-life-threatening head injury, Metro said. “We’re going through a protocol now where we’re examining every possible factor of this, obviously from operator to track condition to just everything,” Metro General Manager Paul Wiedefeld said at a Friday news conference where he emphasized that it was too early to determine the cause of the derailment and that the full investigation will take time. “We’re not going to assume anything until we get through that,” Wiedefeld said. “We’re taking in all of the data and then once it is all collected, we will be able to make some determinations,” Stessel said Saturday. Metro workers had moved the two cars from the scene and were able to see the damage more clearly late Friday. After a derailment, Stessel says the search for a cause focuses on several areas that includes the train’s cars, the infrastructure — such as the rails and switch — and finally, human error. The train’s operator was taken out of service, and was interviewed by Metro and other agencies investigating the incident. The operator was also tested for drug and alcohol use. “That is routine. There is no reason to believe that that is a factor here,” Stessel said. Stessel said passenger accounts of what happened have been taken and that Metro was working with the Virginia Department of Transportation to see whether cameras near the East Falls Church station captured the train cars leaving the tracks. In addition, the National Transportation Safety Board said it has dispatched two investigators to the scene to determine the need for a more extensive federal investigation. Was this a ‘SafeTrack’ work zone? The derailment left evening commuters scrambling for a plan B on Friday. On Saturday, rail riders in Virginia weren’t spared from the effects. People traveling to the Billy Joel concert Saturday night at Nationals Park from Fairfax County could drive to Ballston as there is a county-owned parking deck at Ballston Common to avoid shuttle bus hassles and have more frequent rail service. The derailment came amid the latest round of round-the-clock track work “surges” — initiated by Wiedefeld earlier this year as a way to begin to clear a long-standing backlog of needed Metro repairs — an initiative known as SafeTrack. The derailment happened in the interlocking where the two Metro tracks meet, but not in the SafeTrack work zone, according to Stessel. Service and equipment failures have plagued Metro over the past year, including the L’Enfant Plaza smoke incident in January 2015 that led to one woman’s death. In June, officials said a Silver Line train appeared to hit a derailed piece of equipment during the first phase of “surge” track work. 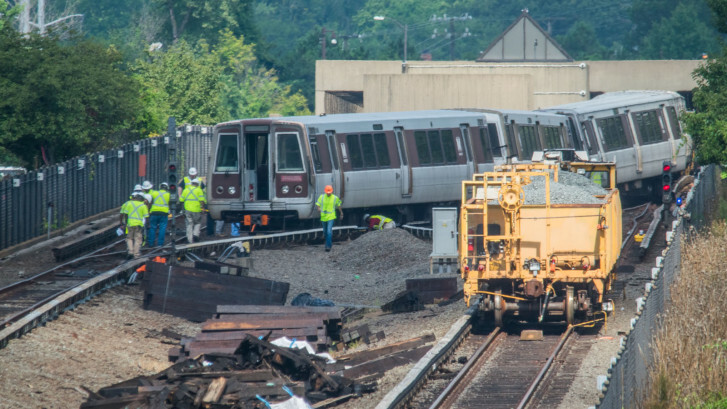 Two workers were fired after a derailment last August near the Smithsonian station caused major delays, and a transformer fire in September at Stadium-Armory led to weeks of repairs and speed restrictions. WTOP’s Max Smith and Mike Murillo contributed to this report.